I have mixed feelings about this Sundance-Institute-supported Sundance hit film. Do I congratulate it for turning Hurricane Katrina-evoking imagery into a mythological tale of a girl named Hushpuppy who leads a post-ice-cap-melting revolution? Or do I excoriate it for borrowing this freighted imagery, trading in on its emotional power, to elevate a film that is otherwise thematically slight? The style of the film, which features elegiac and poetic voiceovers from its young protagonist, is reminiscent of writer/director David Gordon Green’s debut George Washington, which in turn hearkens back to Badlands, writer/director Terrence Malick’s first film. (Sundance is notorious for overlooking George Washington, perhaps why they have supported Beasts so much.) I am a fan of this style, and Beasts is the best film in this style since George Washington — and that includes all of Malick’s recent films. 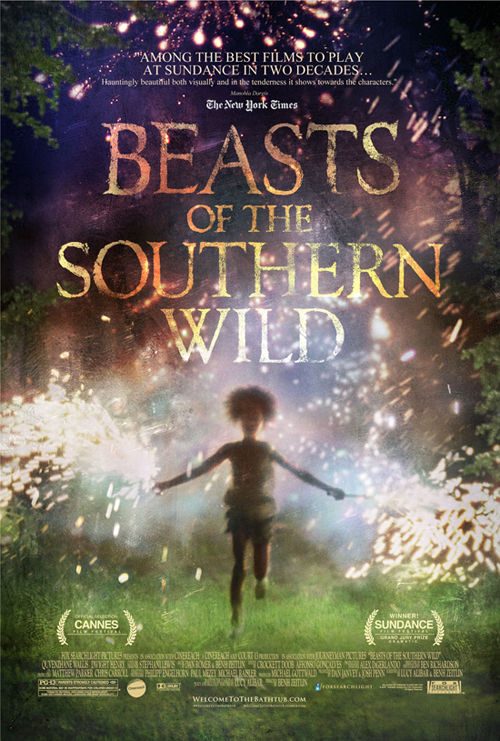 Quvenzhané Wallis, the girl who plays Hushpuppy, gives an amazing… performance? I’m not sure you can say that a “performance” can be coached out of a child this young, but she and director (and co-writer) Benh Zeitlin deserve huge credit for creating whatever the proper term is. She is the heart of the film and her reactions to the strange world around her are its greatest pleasure. Dwight Henry plays her sometime abusive, sometimes loving and always deranged father. Given that his character, as written, is an enigma, I thought he did a great job. The other things I loved about the film were the editing and the music. Editors Crockett Doob and Affonso Gonçalves did a fantastic job of taking what I presume was a great deal of unstructured handheld footage and crafting it into tight, dramatic scenes interspersed with lyrical musical montages. The music, credited to Dan Romer and Zeitlin, was fantasic, a great combination of bayou instruments and modern trance, lyrical structures. Late in the film I got lulled into sort of drifting out of paying attention, in the paradisiacal scene where Hushpuppy meets a mother-angel-waitress. What was that all about? I’ll admit, I lost the thread. As for the beasts, they didn’t quite payoff for me. I had heard the effects were amazing, but it seemed to me they were just some hairy black pigs with fake horns, shot at a low angle. Aurochs are the ancestors to modern-day cows, and there were still some alive at the time of Julius Caesar. There have been some recent attempts “breed-back” aurochs. Why I know this is a long story, and may go some way to explaining why I am immune to the buzz about the titular Beasts in this film. As far as effects, there are two obvious green-screen shots where the beasts are comp’d in at a different scale next to Hushpuppy. Hardly impressive. And hardly necessary for a film that, in my estimation, is a father-daughter love story at its core, not a magical-realist parable about climate-change. I still haven’t made up my own mind about the film overall, but I’m going to recommend it simply as something weird and different and counter-programming to the traditional summer blockbusters. You may despise it as indie onanism, but it is worth seeing on the chance that you fall into the opposite camp, which has embraced it as a masterpiece.